After 2 years? I am finally back in one. Same color as my old one and drives amazing! This is my 3rd CB7 and hopefully the one that stays with me for awhile. Anyone interested in my previous one can check it out HERE. The plans are pretty much the same as my last one. It's primary usage will be for DD with all accessories working. I have two boys and my wife said I can get another project as long as it's a 4 door. 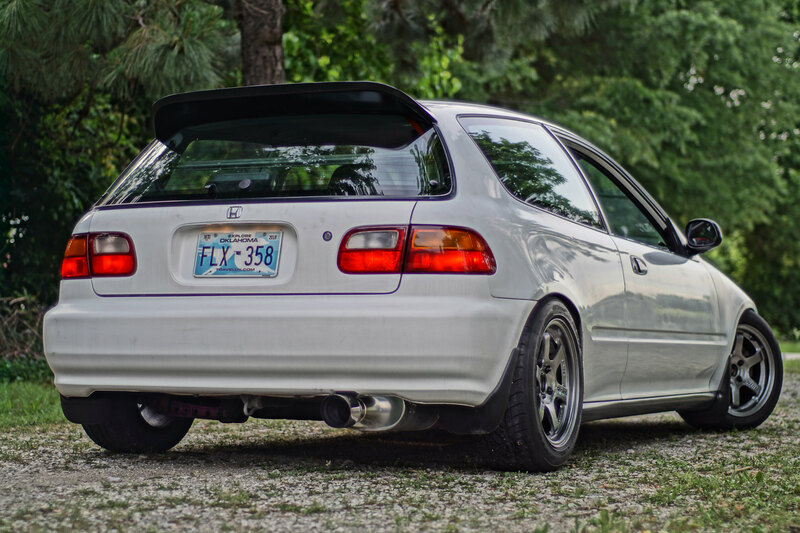 (I also drive a 95 EG hatch) The mods will simply be more oem goodies and just replacing old/worn parts. The biggest change will probably be an H22 swap but that won't be anytime soon, at least I think so. - Original F22A6 with matching transmission clocked at 227K. - Replaced clutch, rear main seal, throw out bearing 9/15/2018. - Picked up CD5 Wheels from junkyard 9/23/2018. - Purchased OEM new bra+mask and usdm 92-93 fogs with harness + switch. Arrives 9/25/2018. Last edited by Vex; 09-24-2018 at 08:02 PM. That’s a good clean start. Type-D red interior? Red, maroon whatever you call it haha. Type-D is nice. I do like the red. Some folks don’t but whatever. Get it lookin good like your last one. For anyone who may be interested, this is what i've been working on. I know it's not a CB but I love both of em. 1995 Civic CX with my buddies wrecked integra's B18C1 with a GSR trans. Also picked up some CD5 wheels to rock with for a little while. Probably spend some money to replace bushings, tie rods and my torn driver passenger side axle. Also have an oem bra and fogs coming in tomorrow, may have to whip out the mirrorless. Last edited by Vex; 09-24-2018 at 08:03 PM. Well I can’t say I haven’t seen much type-D. I’m at a pick a part every weekend. I’m fortunate enough in my searches to find a leather equipped type-D interior from which I still have the door panel leather. Does it still have the OG floor mats? Yes the car is complete. I'll snap more photos today and get em up. ha is that the one that popped up for sale on the cb7 accords page? I saw it on NWP.